At today’s Television Critics Association presentation in Beverly Hills, FX’s president surprised many by announcing that the popular Nip/Tuck series had been cancelled. On the positive side, there are still quite a few new episodes on the way. 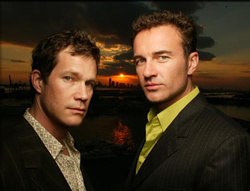 Nip/Tuck premiered back on July 22, 2003 and tells the story of two plastic surgeons, Sean McNamara (Dylan Walsh) and Christian Troy (Julian McMahon). The series mixes drama with satire and irreverent humor as the doctors take on often strange cases. Nip/Tuck was initially set in Miami, Florida but the characters moved to Los Angeles at the start of the current season, the show’s fifth. The series was recently praised by the Gay and Lesbian Alliance Against Defamation (GLAAD) for its ongoing use of homosexual characters. Today, FX president/GM John Landgraf told reporters that the network had ordered 19 episodes for the drama’s sixth, and final, season. That order’s a few less than a traditional TV season but it will bring the series’ installment total to 100 episodes. Series creator Ryan Murphy will stay on board until the end as the showrunner. Yes! I'm tired of it. No! I love this show! Though the move may be a disappointment to devoted fans of the plastic surgeon series, casual fans won’t realize the show has been axed for some time. There are actually 27 new episodes yet to come. Only 14 episodes of the fifth season have aired thus far with the remaining eight scheduled to begin airing in January. The sixth season is expected to begin running in 2010 and not finish airing until early 2011. Stay tuned! This show was actually good for alot of people. I was down, lost my job, girlfriend, all my friends and everything then I got a job at a hospital. You know don’t start something if you cant finish it. I can’t believe this show ended!!! Own every season and sooo in love with it! It’s over and done with – I get it, but I can’t believe they seperated Sean and Christian, after watching SIX seasons of these two guy, practically BROTHERS, grow together, they decide to end it with them going seperate ways? Defffffinitely needs one more “Finale” Season with a BETTER ending!!! !